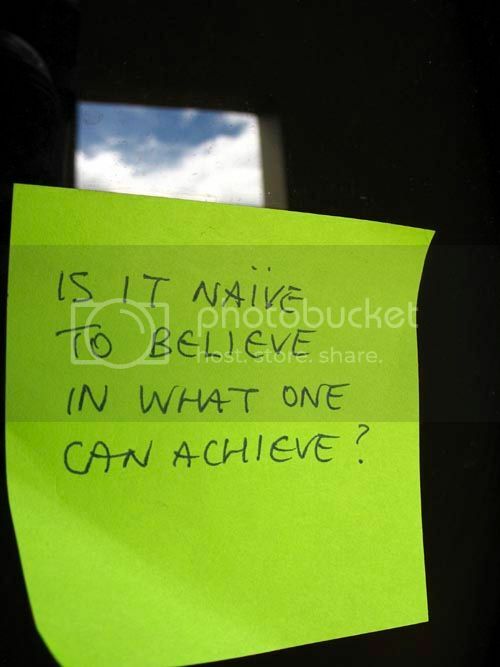 If what you are asking is, “Is it naïve to believe that one can achieve?”, then my answer is no. I don’t think that it is naïve, but if it is, then it is a good naiveté that many of us have lost and need to regain. Many people are so beleaguered, so traumatized that they do not allow themselves to believe that they can achieve anything outside of the everyday basics and some don’t even make it that far. They have assumed the position of complete dependency and go as far as to expect that others will carry them. To give up on, or to have this belief battered out of us, is a sure way of cheating ourselves and the society that we live in. This might just be my opinion, but I suspect that in our society, the impulse which is most aggressive and insidious is the urge to repress and negate. Is it just coincidence or the result of hormonal storms, that there is such a huge difference in the demeanour of primary school children and those at the secondary school level? I remember this coming to me like a slap in the face when I found myself in the midst of a class of tiny children. The electricity was tangible. They sparked. It was in their smiles, their restless energy, their breathing, their attention, “Beautiful children, what will become of you?” My mind ran to their older brothers and sisters and what a transformation! The light and sparkle gone out of their eyes and replaced with downcast glances, sullenness, shuffles and slumped shoulders. We laugh at each others dreams. We sneer at ambition, at people who make big plans. We slap, punch, and pinch the air out of each others sails and dreams. We encourage and even reward mediocrity. We believe in the comforting, equalizing power of the lowest common denominator. We go nowhere, but at least we go nowhere together. We are drowning, but we prefer to keep the stranglehold on our neighbour so that at least our fates will be identical. When our countrymen leave our shores, we acknowledge that they have escaped our clutches, we reveal how little we value ourselves when we conclude that they have gone to “better” themselves. This didn’t happen overnight. Somewhere in our past, hundreds of years ago, we were also sparking and new, but long established, fragile orders were unceremoniously broken and uprooted and trampled upon to pave the way for the machinery of production and the accumulation of wealth. Somehow, we became convinced that there was not enough love or resources or recognition or respect for everyone in our society. Somehow, under the constant threat of shipwreck, we became complicit and accepted that it was each man for himself. We didn’t mind when the Devil took the hindmost, as long as we weren’t it. When someone in your family dies, the grief is bad enough, but so many families have to contend also with agonizing thoughts as they relive time and time again the horror that their loved ones had to endure from senseless, violent deaths. To really think about it makes you want to cry. It is my belief that the deceased are released and beyond torment, so our grief should really be for the living because they often do not know such peace. What does it mean to our countrymen in distress, who have lost relatives and friends in this way, to see that life in this society proceeds, business as usual, without more meaningful and sustained marks of respect and solidarity? Already the braying of revelers is filling the air. Last night many people went to bed with nothing on their minds but the quiet satisfaction that they had booked and paid for their Carnival costumes. They were imagining what they are going to drink and eat and where they are going to be liming. They will assiduously map their bacchanalian trails across this bloodstained landscape. No one ever thinks to stop the Carnival. I meant basically two things in the one statement but left it for each person to get whatever he/she got from it. I meant what you thought - as well as ... is it naive to believe in what one can achieve (one idea, one person, one attempt, one message, one post it, one hug, one whatever ...) All going bac to the original message that it only takes ONE to start. Oh yes, of course! The power of one! Any communal act is the sum of individual acts. Our national motto says, “Together we aspire, Together we achieve.” Nothing happens without the individual will, either alone or in concert with others, making that decision to act. This is what civic involvement is based on, when individuals don’t see a “we” addressing a problem affecting their society and ask the question of themselves, “Why not me?” Most great achievements begin as idea in the heads of individuals. It helps of course, if a groundswell of support develops but this is not always present or necessary to achieve success. One person’s persistence can lead to laws being created or changed. One person’s artistic expression can inspire and create positive worldviews. One mother leaving the comfort of her bed in the early morning to prepare her family’s breakfast can provide an atmosphere of safety and caring. One person’s decision to find a bin before disposing of litter contributes to the protection of our environment. One kind word or deed or post-it note for another human being can turn a day or a life around. The spoken word has such a great impact on children. If we think about it we might recall some strangers along the way who inspired us with nothing more than gentle words of respect or praise or encouragement. I think that we often forget or undervalue the fact that tiny creeks make the ocean. We all know these things to be true and many have urged that we use the power of one for good. Many songs have addressed this potential: “Let there be peace on earth and let it begin with me” or “It only takes a spark to get a fire going.” Neil Armstrong said it best, I think, "That's one small step for a man, one giant leap for mankind." Elspeth, this question is the best question of all. As I read what you wrote I remebered my third meaning for the statement: 'one' being many people gatehred as one (strength in unity). Sniper in “Portrait of Trinidad” believed that we were already demonstrating this unity. Truth, wishful thinking or the rose-tinted view of a hyperpatriot?